Our premium tri-layer therapeutic surface consists of a top layer of our open cell hybrid Soy Visco Medi- Gel, clinically proven to keep Patients/Residents cool while dissipating moisture from the body reducing the incidence of pressure ulcers. The second layer is a high resilience Soy Visco Medi-Foam which provides consistent pressure redistribution in all positions while articulating. The bottom layer carries our low compression, high density Soy Medi-Foam for weight bearing and longevity. With a cover consisting of a 4-way stretch for easy removal, a zipper overlay for infection control and an expandable polyester thread fibre that imbeds itself to material, this fabric is completely fluid proof. Our unique PTRS (patient transfer rail system) reduces friction in Patient/Resident transfers and roll out fractures. With an anti-slip, surgical grade base material of Grip X and Recovery 5, the NSC4000 allows for easy slide during emergency procedures, while allowing anti-slip for precision articulation. NSC Medical’s hybrid Soy Visco Medi-Gel is our own infusion blend where gel is INFUSED into our Soy Visco Medi-Foam. This unique technology provides true gel attributes; a cooling surface for the Patient/Resident’s skin, combined with the comfort and durability of pressure redistributing Soy Visco memory foam. This neutralizes the off gassing smell that irritates Patients/Residents, as well as reducing heat retention which is the largest complaint from 100% petrochemical based products. Our unique PTRS System can reduce the friction rate while transferring Patients/Residents at the same time allowing the Patient/Resident to easily get out of the bed. NSC Medical does not cut corners when it comes to fire prevention by using fire barriers as a cost effective method. We only use Fire Rated Foams providing guaranteed results with no compromise in Patient/Resident, Nursing Staff and Facility safety. Cover: NSC4000 covers are made with Recovery 5, a surgical grade 4-way stretch top which reduces heat buildup and provides a low shear, non-friction surface that is anti-microbal and waterproof. A 16 oz Anti-Slip Grip X bottom provides low anti-friction rate for Patient/Resident transfer. By adding a full layer of Soy Visco or Soy Hybrid Gel as a top layer for all pressure redistribution therapeutic surfaces, we reduce the incidence of pressure ulcers, assist with healing skin breakdown and reduce Patient/Resident turning times for Nursing Staff. 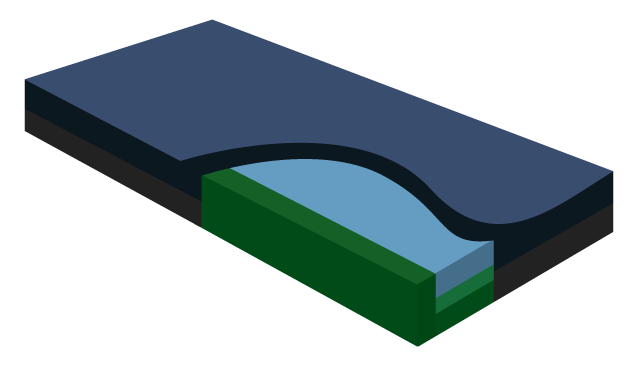 Most industry surfaces only offer pressure redistribution sections to reduce costs and meet minimum requirements.